Kovalam Beach is one of the most famous beach in Kerala. It is awesomely beautiful and heaven of serenity. The sun shining upon the blue waters and making the surface of the sea shimmer like sapphire is a gorgeous sight that dazzles the eyes of every onlooker. The golden sandy beach sandwiched between the blue waters and the green palm trees dotting the periphery of the coastal area is the perfect place for unwinding from a stressful day. It is the preservation of this place that the tourists from all over the world visit this beach multiple times whenever they get the opportunity. Kovalam Beach is a perfect destination for a picnic or outing because of the privacy the beach offers. If you need some rest the beach has tall coconut trees and palm trees which give a soothing effect to the weavy travelers by providing a shade. 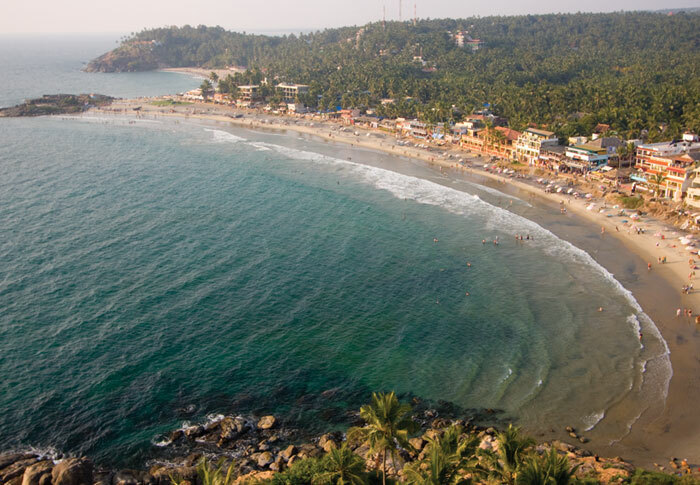 The best time to visit kovalam beach is in between november and march. You can run around the splashing waves against the shoreline and if you want to feel an adrenaline rush through your body, go for some adventure sports in this popular beach. Being the major tourist attraction Kovalam beach is seemed to be crowded all time. A person who visit kovalam will never go back without visiting this eternal beauty of nature. People from all over the world visit this place every day to make their quality beach holiday vacation memorable. People looking for a stay that opens up to this breathtakingly beautiful arabian sea then Gods Own Country Ayurvedic Resorts is the best option. They also provide special offer on accomodation rates also.